Sat, Sep 15, 2018, 04:30 am SL Time, ColomboPage News Desk, Sri Lanka. Sept 15, Colombo: Sri Lanka Navy - Indian Navy Joint exercise, SLINEX-2018 held at Trincomalee from 07 -13 September 2018 concluded on a successful note in Trincomalee on Thursday, the Navy said. Around 1,000 naval personnel from both countries took part in the seven day exercise which comprised two phases, the Harbor and Sea Phases. 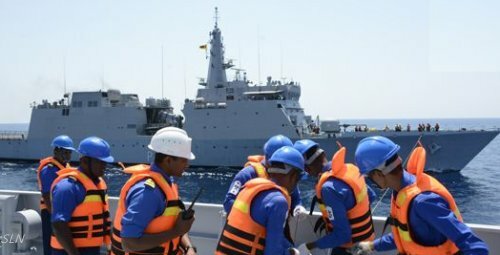 Sri Lanka Navy ships SLNS Sayurala, SLNS Samudura, SLNS Suranimila and Indian Navy ships INS Sumitra, INS Kirch, INS Cora Divh together with two Dornier air craft and a helicopter joined the naval drill. The wide range of activities performed at SLINEX include; ship maneuvering exercises, transfer of persons and goods between ships by means of helicopters, Visit Board Search and Seizure (VBSS) operations and communication drills. Further, this year's exercise was joined by personnel from the Special Boat Squadron (SBS) and Rapid Action Boat Squadron (RABS). SLINEX 2018 enabled both navies to rehearse and improve own capabilities and enhance operational effectiveness required to maintain maritime security in the region by integrating forces. The pilots of Sri Lanka Air Force (SLAF) also augment the capability of this joint exercise, landing a helicopter onto the helipad of SLNS Sayurala. The event etched a significant milestone in Sri Lanka Navy (SLN) history as it became the first instance of landing a helicopter onto a SLN platform. The SLAF pilots who utilized a helicopter belonging to the Indian Navy for this drill, executed the exercise to the perfection. The training drill was a whole new experience for both SLN and SLAF personnel and they engaged in the practice with full of enthusiasm. Exercises of this nature would help foster mutual understanding between the Sri Lanka Navy and Sri Lanka Air Force further and its fruitful outcomes would make way for sister forces to work in unison in a bid to strengthen security of the island's territorial waters.